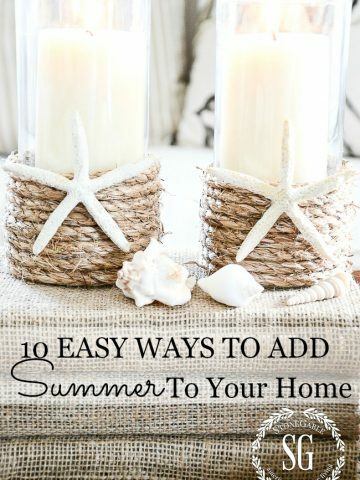 Now is the time to be thinking about summer decor. And let’s start by getting our bedrooms in a summer state of mind. As summer temperatures rise and humidity begins to soar, we should be adjusting for those changes! 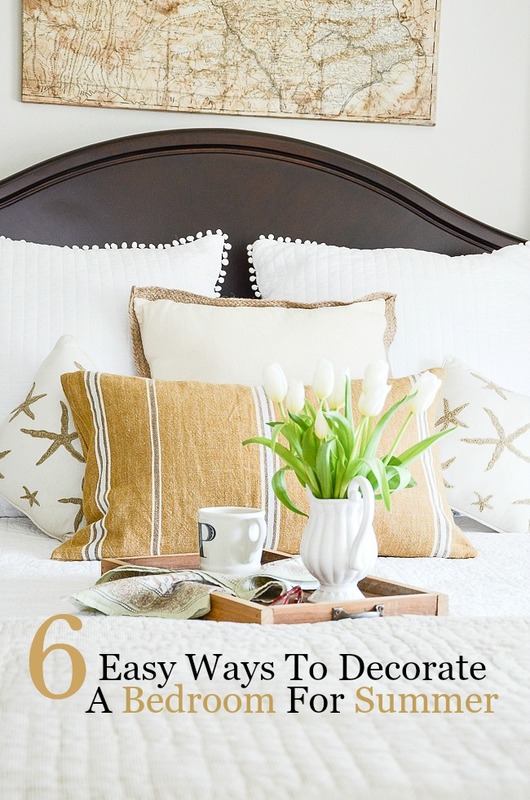 Today I’m sharing 5 easy ways to decorate your bedroom for summer. Not only will your bedroom look cooler it will feel cooler too! I love to make subtle changes in my decor to make my home more comfortable and more in tune with the changing seasons. 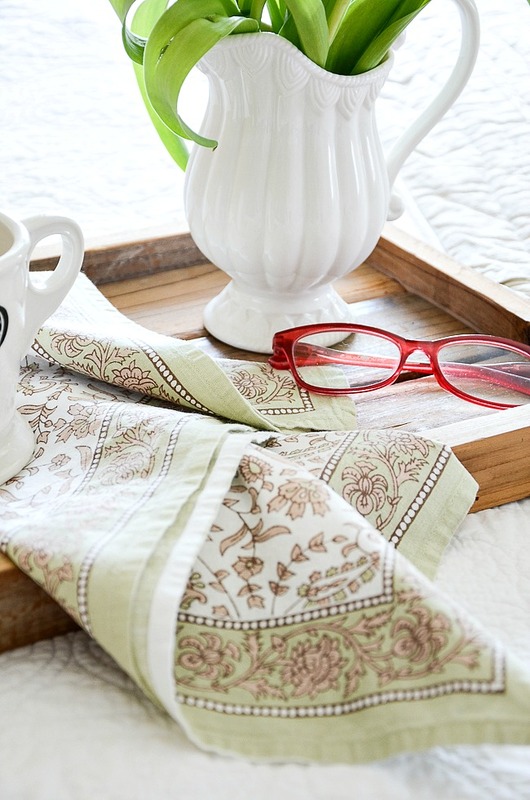 So here are 5 easy peasy, can-do, ideas to create a summer sanctuary in your bedroom! 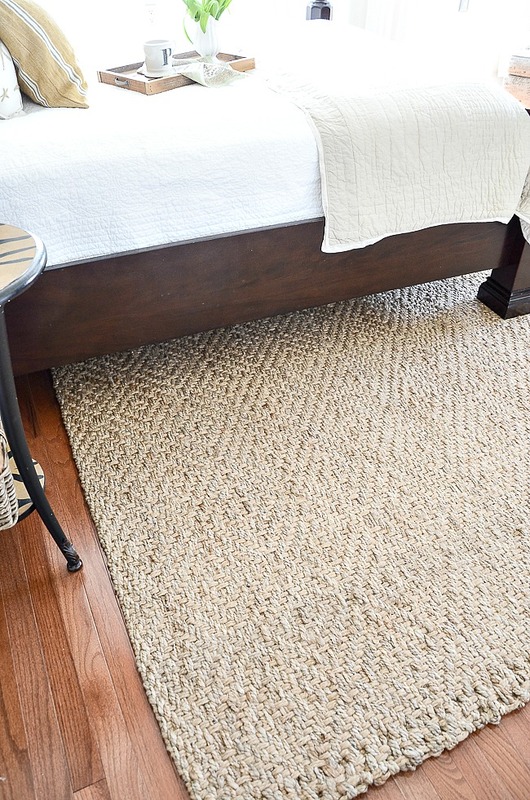 The first thing I did in my guest room to get it ready for the hoards of summertime guests and family was to add a new sisal rug under the bed. What a difference! 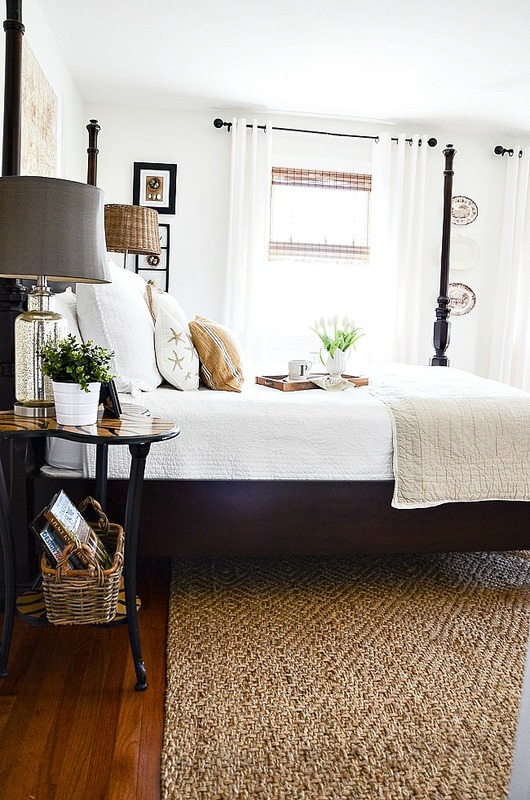 Not only does this pretty natural fiber rug gives a soft comfy landing for feet getting out of bed it also gives the room a very fun casual vibe! 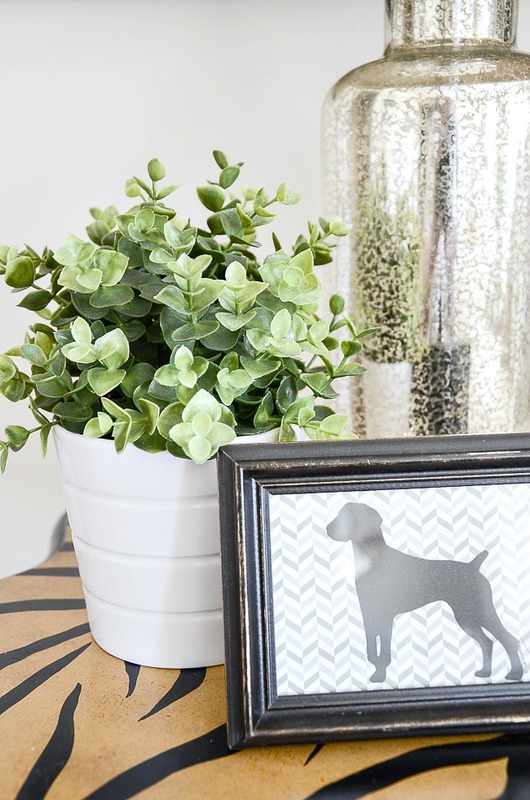 It works so well in this room that I just might keep it there no matter the season! 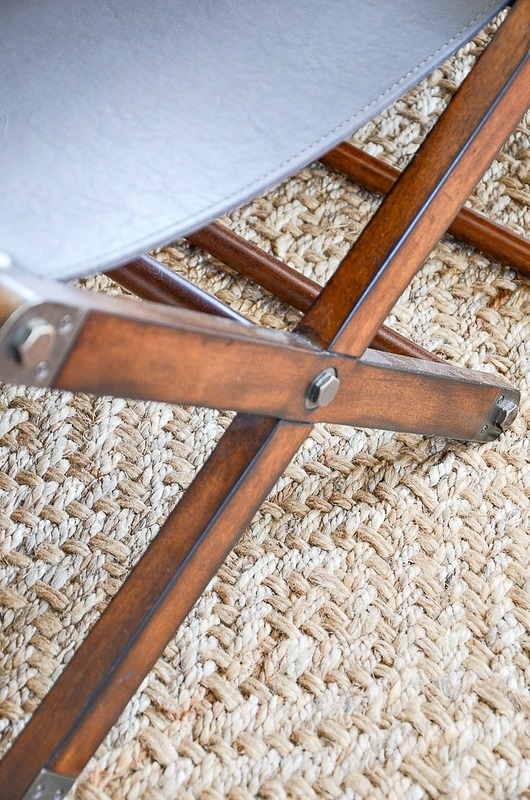 The price of my sisal rug was just too perfect to pass up and I got free shipping too. Take a look HERE. The selection of rugs (and everything else) on eBay is huge! Did you know that eBay has 900K rugs? Wow! And 90% of them ship for free like mine did! I’m so impressed with their vast array of choices to furnish and decorate a home. It is a home decorator’s treasure trove! Many large home décor and furniture sellers have a presence on eBay, with best of the web pricing so you can get all the updates you want for your home in one place. Don’t you love the soft variegated pattern in this rug? This rug can be layered over a larger rug or wall to wall carpeting. A great look for summer! Choose a rug that works with your room and feels like summer to you! This next idea is a biggie! If you have the same bedding on your bed season after season you may not be sleeping as comfortably and well as you could! I switched out a big duvet for a light natural and white striped thin quilt. Just enough for guests if they get chilly! And I love the lighter look it gives the bedroom. I also switched out matching pillow shams for some cute white pom-pom euro shams. Look at these white euro shams HERE. The matelassé coverlet stays on the bed all year. 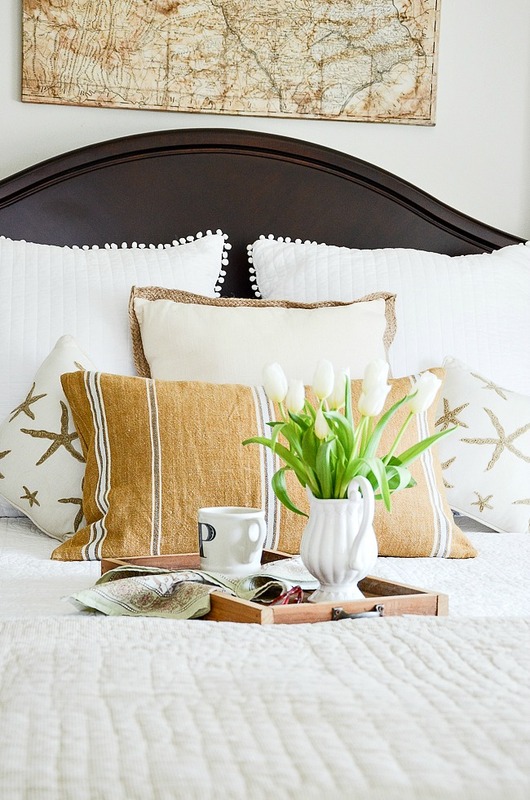 You can see a gorgeous, versatile coverlet HERE. I have matelassé coverlets on all the beds at StoneGable! Easy to style and so easy to wash! You might want to think of investing in delicious, well-made cool cotton or linen sheets like the ones HERE. Great sheets are the key to a good night’s sleep. To make a room look crisp and cool nothing does it better than white! I switched out lots of other accessories for white. 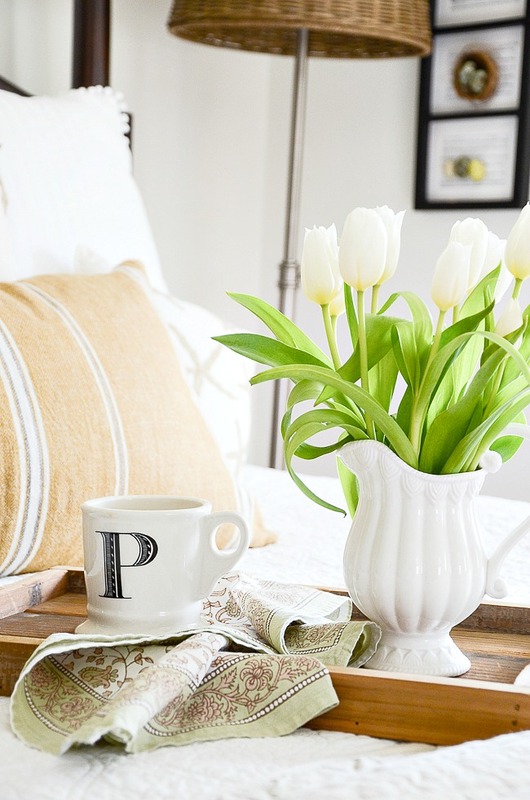 White sheets, white bed linens, white towels, white throw and even a little white pot for a plant! 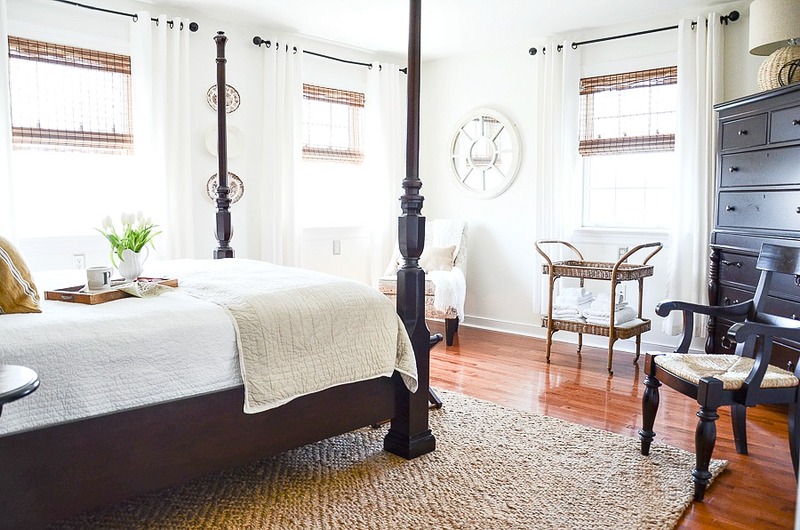 You will be surprised how a little bit of white can really add a summer feel to a bedroom! I added white towels to a wicker cart. Another summery look. The top is open for guests and family to put their wallets, toiletries and other items on. I must admit this is my very favorite way to decorate! 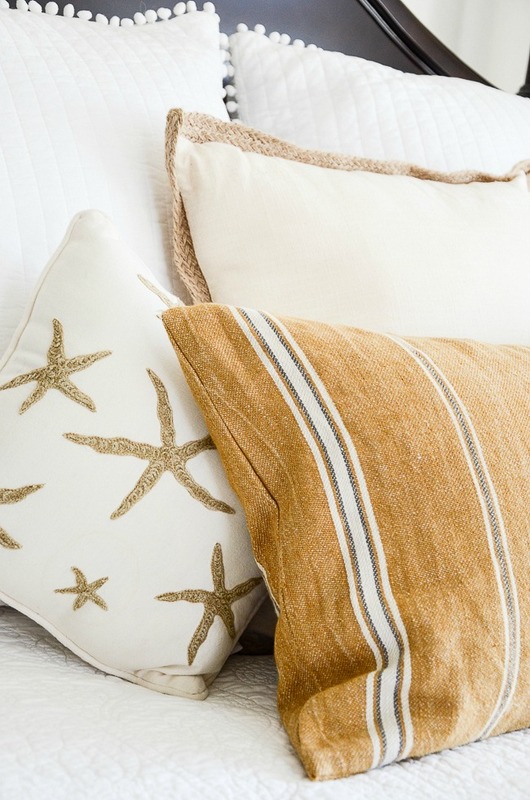 Adding a pop of summer color with a pillow or adding a pillow or two with a summery print or motif is a perfect addition to a bedroom. There are so many fabulous pillow choices! And how fun to find the summery ones that are just right for a bedroom in your home! See eBay’s decor hub HERE for almost endless options! 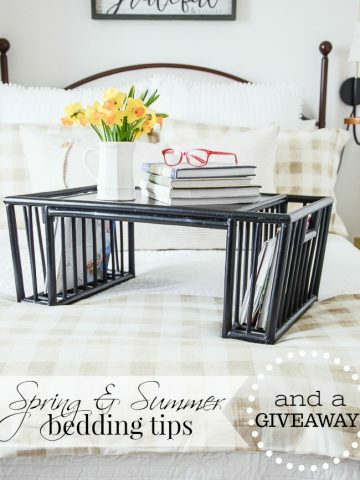 And your bed tray does not really have to be a true “bed tray”. Any tray or flat surface will do! I am sighing over this wood and gold metal tray… see it HERE! I think I’ll get it for my master bedroom makeover! What is prettier than a bunch of charming flowers in a sweet vase or pitcher like the ones I use. These tulips came from the grocery store but soon I’ll be able to use cuttings from my annual garden. 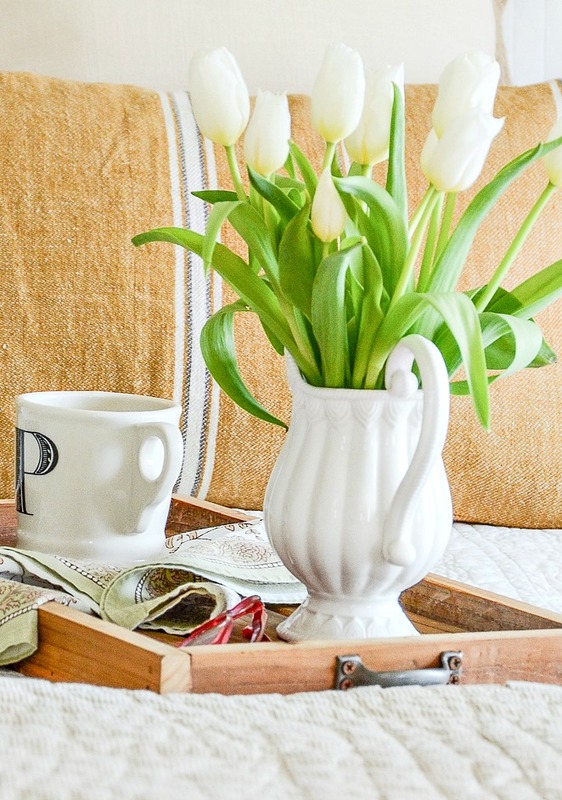 I think every bedroom should be graced with a pretty little vase of flowers that are a telltale sign the season! 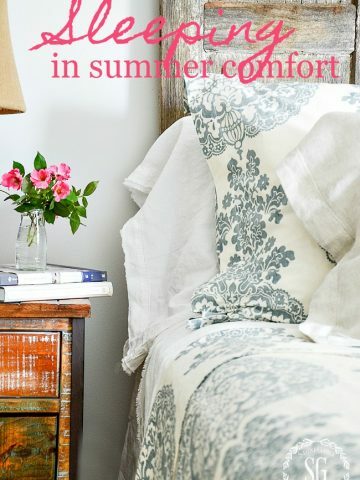 Start making a few summer changes to your bedroom and you will be sleeping pretty! Do you have a summery tip for the bedrooms in your home? Please share! Thank you to the kind folks at eBay for sponsoring this summer decor post. All opinions are mine. What a pretty pretty room Yvonne. Simple and lovely. Yvonne, would you please explain the differences in the vast assortment of sheets? buy nice ones but don’t seem able to find what I want! Hi Yvonne, would you share where you found the lovely gold pillow on your guest room bed? It is just what I have been looking for. Thank you so much for your great blog. It is full of practical information and inspiration. Hi SDonna! I found the pillow cover you are asking about at my local pottery barn outlet. Hope this helps. Such gorgeous!! So fresh and welcoming. Great tips, Yvonne! Love that rug! #pillowspillowspillows ! 😉 Pinned to my Bedroom Inspirations board! Hope to see you at Haven? You never disappoint, as always, simply put, elegant! I found it a HomeGoods. I didn’t know what I would do with it but it was so different I just had to bring it home. It took a year or so to finally land in one of my guest bedrooms. I love the changes you made to your guest room. It looks so bright, clean and inviting. Thanks for the great tips. As always you have the best and easiest ideas!! I love the guest room and the airy feeling!! Thank you for sharing where you purchased your items too!! I LOVE that part!! This post was perfect for me right now! I am redoing my bedding in lighter colors. I am looking for the pom pom white euro shams but can’t seem to find them on ebay. I clicked the link but it brings up a lot of other options. Can you steer me in the right directions? Thanks so much! HI ANDREA, Look on eBay for them. Good Friday morning Yvonne! 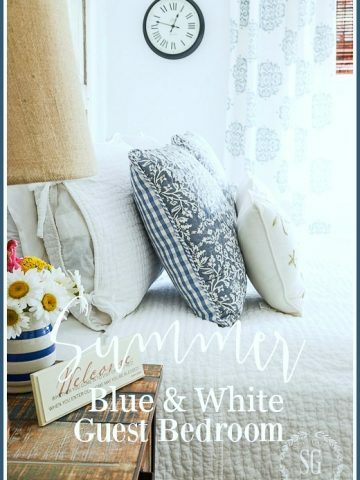 I love your guest bedroom and the summer decorating. I recently changed all of our bedrooms in our home to a lighter feel for summer. I even change out the curtains in each room to sheers for summer.I love to open the windows and let the summer breeze make the curtains dance. Have a great weekend. At Christmas I put electric candles in all the windows in my home. All the outlet work on a switch in my foyer. Your room looks so light and inviting, love the pillow shams with the pom- poms.I just put away my comforter and bought a light weight quilt for summer. Look for great mercury lamps on eBay. I found this one at HomeGoods years ago. I have freshened up our home in recent months and after listening to one of your DTT podcasts, I purchased two sets of Lands End white, monogrammed linen sheet sets using 50% off coupons. Added a little luxury at sale prices!